Burning Life is now less than a week away. From inside the fence, the sights to see and things to do are incredible. All the kids who have built plots on the playa have done an amazing job. I wanted to relate a story, though, that I think illustrates a change in the way kid avatars are viewed at these big events. Certainly a change from the days of SL5B only a year and a couple months ago. It all starts with a wristband: the very one I mentioned in my last post here. It was designed as a nod to the First Life Burning Man, and to the KidsVille camp at same. A freebie in the spirit of the real-world event. I have those available for free at Inner Child Camp on the virtual playa. I also told a Burning Life Ranger about them: he snagged a copy of the "Lost Child Procedure" from the real event, and put it up at Ranger HQ. All good fun. I also gave copies of them to the head of the greeters, who was putting together a Kids' freebie pack for the entrance to the event. For those unaware, it really does behoove you to come in through the entrance, get the background on the event, and be greeted onto the playa. Its a part of the fun of the event, IMO. Anyway, somewhere after it went to the greeters, something got miscommunicated. 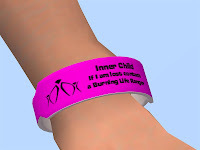 I don't know if it was me, or who, but it went from "here' a fun thing to give to kid avvies" to "child avatars must wear this to be admitted to Burning Life." In spite of it being very clear both last year and this, and with several builders on the playa who are also child avatars, rumors started to go around that kids were not given express permission to be at Burning Life. Yikes. To the credit of the event organizers and others, however, they stepped in to quash this rumor within a half hour of its inception. 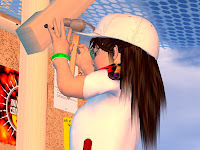 A couple Residents heard it, passed it immediately up the chain, and notices went out o the Burning Life groups and the Second Life mentors group, making it clear that child avatars have equal access to the event -- same as anyone else in Second Life. This is a major change from previous events, but not unheard of with Second Life events since SL5B. Last year's Burning Life had a "maturity policy" that made it clear that all forms of avatars were welcome. SL6B included child avatars within their initial FAQ, again spelling out that our involvement was welcome. Anyway, I felt this was important to note to all SLC members: if you have felt unwelcome in Second Life, or have felt that you are not on an equal footing, the organizers of Burning Life consider you a valid, valuable member of their family. So come on out and party with all of us on the virtual playa! Maybe I've had an incredibly lucky second childhood but I have never been to any Linden event where I didn't feel welcome. This might sound really ignorant, but... isn't Burning Man kind of a grown-up event? ...like... sexual liberation, drinking, and drugs kind of adult? I mean I know it's an arts festival of sorts, but I guess part of me is like "huh?" that anyone was surprised that there might have been a rumor that kid avatars didn't have express permission to be at the SL version. I didn't GO, so forgive me if I'm totally off here, but... doesn't this kind of make it a lot unlike the real version?